Obviously it is highly dangerous for me to compare Jeremy Corbyn to Donald Trump. But in some areas their tactics and approach are similar. This past few weeks have brought that into an uncomfortably sharp focus. Trump’s reaction to the Charlottesville murder shouldn’t surprise us. A group of people who helped him get elected, committed an atrocity, so he refused to directly condemn them. Instead, he condemned ‘all violence’ on all sides. Added to this was David Duke, from the Ku Klux Klan saying they were ‘fulfilling the promise Trump had made to them at the election. This has resulted in worldwide condemnation for Trump particularly from those on the left. Why didn’t Trump directly condemn white supremacists? How is he claiming moral equivalence between far-right Neo-nazis and far left anti-racism activists? Doesn’t what David Duke said prove Trump is a racist who won on a racist platform? Well, a close look at the statements of Jeremy Corbyn over the years should sound a warning to the left. Corbyn has a long record of activism against racism and capitalism. However, as part of this, when people who he supports commit violence, he tends to condemn all violence. When ethnic groups who aren’t, shall we say, his natural constituency, are attacked, he condemns all racism. But attack the causes he believes in, and he is highly specific in his condemnation. Let me be more specific. When Islamophobic acts are committed, Corbyn directly condemns islamophobia. He is right to. No problem with that. But when asked to talk about anti-semitism, he frequently says ‘I condemn unreservedly anti-semitism and all forms of racism’ (my italics). He will occasionally add islamophombia to that, straight after the word ‘anti-semitism’. It is a small difference, but it is an important difference. Witness also his recent dissimulation over what is happening in Venezuela. If a capitalist government were to commit the acts the Venezuelan government are committing, you wouldn’t be able to see a TV screen without Corbyn on it directly condemning that Government’s actions. But because it is Venezuela, that paragon of once again broken socialist hopes, Corbyn hid for a few days then condemned all violence. There has also been what I consider to be his disgraceful treatment of Sarah Champion, who has tirelessly campaigned for childrens’ rights since entering Parliament. Champion wrote a strongly worded article about the need to be able to say that groups of Muslim men of Pakistani descent were grooming white girls for sexual abuse (and pointing out how fear of making this point means it isn’t being investigated as directly as it should be) and found herself sacked, with Corbyn insisting on the need to condemn ALL sexual abuse, completely missing her point, because of whom she made it about. 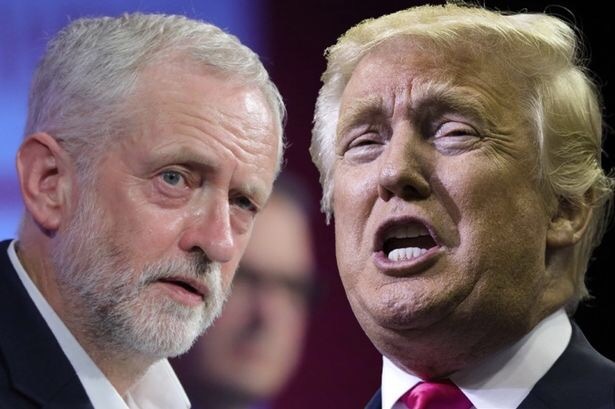 What Corbyn has done is not much different to what Trump does. On the David Duke issue, Jews I know have voiced the fear that should Corbyn win an election, it would further embolden the anti-semites among his supporters. They would argue they are merely fulfilling Corbyn’s promises to them. His use of language, both what he does and doesn’t say, is dangerous like that. Corbyn isn’t an anti-Semite. In my view there is no evidence for this, and I think it is often used to avoid serious debate about austerity and his policies etc. But I can understand why people have doubts. He is frustrated that the rhetoric around this continues, but if he studies what people say about Donald Trump when he does similar things, maybe he might learn something about the importance of just a few words.